KMR’s Clinical programs are designed to help realize a company’s clinical performance potential by providing clinical groups with both the analysis to help benchmark their performance against industry as well as the data to help make better business decisions. Whether trying to set realistic study start up performance goals or select the best sites, KMR’s clinical programs are designed to meet the most pressing business needs. Each initiative is assessed for key drivers and trends using in-depth statistical analysis and a core set of metrics in which your company is benchmarked and ranked against your peers. Clinical Advantage offers a foundation in understanding your performance. CORE, KMR Group’s comprehensive enrollment suite, takes enrollment decision making to a new level. Questions relating to study placement, expansion into emerging markets, the length of recruitment and the number of sites are answered easily and within seconds. Getting a broader perspective on these questions is prudent business practice, which means accessing the most comprehensive information available. 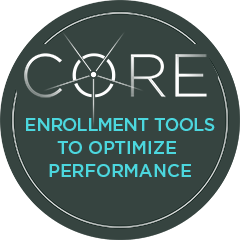 Designed to optimize enrollment, CORE provides critical performance information at each step of the recruitment lifecycle, including study start-up, country selection, site selection and more. In addition to Clinical Advantage and CORE Enrollment, KMR offers specialist studies and custom analytics to help clients meet their business needs. Each of our clinical tools is grounded by a unique feature: unparalleled industry benchmarking data. The type of performance information provided as part of these services is not available elsewhere and cannot be obtained from public sources. It is based on industry data collected directly from user companies, and consists of 1000’s of recent trials and tens of thousands of investigator sites.